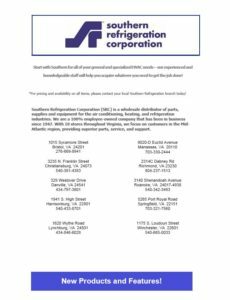 Southern Refrigeration Corporation is a 100% employee-owned company offering ESOP profit sharing, complete benefits, competitive salaries and an enjoyable workplace. To fill out an Application for Employment anytime click here and fax to 540.343.2163 to the attention of Human Resources or email it to rwalters@srcusa.com. Southern Refrigeration Corporation is looking for a counter salesman for our Harrisonburg branch who is primarily responsible for selling, marketing, promoting, and demonstrating products. Also, this person is responsible for increasing business by generating sales to new customers and by selling additional products to existing customers. This position reports directly to the Branch Manager. Answer customers’ questions about products, prices, availability, and credit terms. Contact new and existing customers to discuss their needs. Emphasize product features based on customers’ needs and technical knowledge of product capabilities and limitations. Select the correct products or assist customers in making product selections. Collaborate with colleagues to exchange information such as selling strategies and marketing information. Enter orders into automated system and pick customer order tickets. Stock products on displays, self-service areas, and warehouse. Keep counter areas organized and presentable. Southern Refrigeration Corporation is looking for an IT Support Specialist that is self-motivated and can provide assistance with technical, hardware, and software system problems. The job would also consist of being the lead contact for our B2B (E-commerce) website. Specialist would deal directly with end users and must effectively communicate answers in a way they can understand. Expected to be efficient in problem-solving and have open communication with the Director of IT. Travel may be required at times as we continue to grow and open more branches. Taking initial telephone or email inquiries, and troubleshooting issues, that may arise which would include corporate software questions and relatively simple hardware, software, or network problems. Ability to set up new computers and stay up to date with the latest operating systems and Microsoft Office products. Lead contact for our B2B (E-commerce) website. Roles would include setting up new shoppers, maintain content-rich data on new products (data sheets, images, and more), importing new orders, etc. 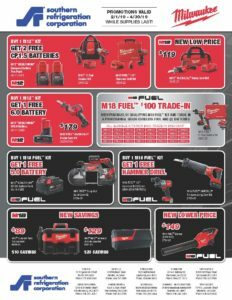 Southern Refrigeration is now stocking Milwaukee!